Produced by I Wrote Dat! Carly Sakolove in The Book of Merman. Photo by Russ Rowland. 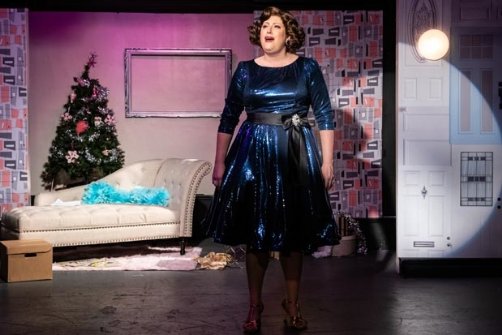 BOTTOM LINE: Anything goes—and nothing works—in The Book of Merman, an ill-conceived musical about two Mormon missionaries who knock on Ethel Merman's front door. Pun-based theatre always seems like such a good idea at the time. Just sitting here I’ve already come up with Hello, Dalí!, in which young Salvador must find the perfect wife before his clocks melt, and The King and Ai, in which dissident Chinese artist Ai Weiwei time-travels to the court of Henry VIII to make a documentary in protest of the formation of the Anglican church. Generally, such "ideas" (if they can be called such) are best relegated to late-night tweets that few will read and none will remember. But a far grander fate has been constructed for one such pun: The Book of Merman, in which two Mormon missionaries ring the doorbell of Broadway doyenne Ethel Merman, is everything one might imagine: preposterous, unimaginative, and fatally confined within its tissue-paper-thin premise. Yes, The Book of Merman’s creators Leo Schwartz and DC Cathro have astutely recognized that “Mormon” and “Merman” share four consonants. But neither of those words are themselves ripe for parody: the 2011 smash hit The Book of Mormon, an actual satire, has already cashed in on all the Latter-Day Saints jokes to be made, although that doesn’t stop Schwartz and Cathro from rehashing them. And there’s really nothing all that funny to say about big-voiced Ethel, which may be why this show winds up begging the audience to find humor in the brevity of her marriage to actor Ernest Borgnine (who cares?) and the embarrassment of the 1979 Ethel Merman Disco Album (who remembers?). Like its Mormon-musical predecessor, The Book of Merman foregrounds a ragtag pair of idealistic recruits, the straight-laced Elder Braithwaite (Kyle Ashe Wilkinson), who mainly just wants to serve Jesus, and the not-so-straight-laced (or straight) Elder Shumway (Nicholas J. Pollina), who brings a biography of Our Lady Ms. Merman to Bible study (the incessant yuks about his sexuality get cringeworthy pretty fast). Somehow the duo winds up inside the living room of Ethel Merman (Carly Sakolove), star of Gypsy and Annie Get Your Gun, and good news: she’s not dead, only about 110 years old, living incognito and looking fabulous for her age! Alas, because this is where the pun ends, this is also where the plot ends. The rest of the musical, up until its nonsensical final twist, shows the trio helping each other to find their best selves, courtesy of bizarrely earnest original ballads like “The Joy of Christmas” (huh?) and flagrantly plagiaristic clunkers like “You’re the Best” and “Whatever You Try, I Will Also Do Better," in which the titles of Merman's greatest hits are run a few times through Google Translate. All three actors have pleasant voices, but even Ethel couldn’t sell this score. And while Sakolove has captured a few of Merman’s quintessential vocal mannerisms, she often tries to substitute jazz hands and shimmy for the star’s unique dynamism and delivery; her upper range becomes woodwinds just where Merman’s went brass. By the time the missionaries had started in on a song about friendship that features seemingly endless phallic wordplay (and by wordplay, I mainly mean the word “hard” repeated while making rude gestures), my mind wandered once more to the possibilities of other pun-bearable musicals. How about The Light in the Pizza, about a small firefly living inside a slice of pepperoni in Florence, or maybe 42nd Streep, in which Meryl must decide between a career on the screen and her true first love, tap dancing? Hey, you can’t blame me for trying. Or maybe you can. The Book of Merman is by Leo Schwartz and DC Cathro. Directed and Choreographed by Joe Langworth. Set and Lighting Design by Josh Iacovelli. Sound Design by Raymond Schilke. Costume Design by Pablo Borges. Music Direction by Aaron Benham. Stage Manager is Tracey Woolley. The cast is Nicholas J. Pollina, Carly Sakolove, and Kyle Ashe Wilkinson.